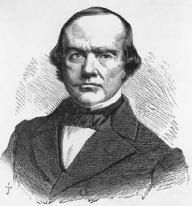 Benjamin Robbins Curtis served as an associate justice of the U.S. Supreme Court from 1851 to 1857. A native of Massachusetts, Curtis wrote a famous dissent in Dred Scott v. Sandford, 60 U.S. 393, 15 L. Ed. 691 (1857), a case that upheld the legitimacy of Slavery and denied free African Americans U.S. citizenship. Curtis was born in Watertown, Massachusetts, on November 4, 1809. He graduated from Harvard College in 1829 and Harvard Law School in 1832. Curtis established a law practice and became active in the Whig Party. In 1851, he was elected to the Massachusetts House of Representatives and later that year was nominated to the U.S. Supreme Court by President Millard Fillmore. During his brief tenure on the U.S. Supreme Court, Curtis made a lasting impact with his dissent in Dred Scott and his majority opinion in Cooley v. Board of Wardens, 53 U.S. 299, 13 L. Ed. 996 (1851). Curtis was one of two dissenters in Dred Scott, which the majority opinion viewed as the final word on the legal merits of slavery and the issue of citizenship for African Americans. Chief Justice Roger Taney's majority opinion concluded that at the time of the ratification of the Constitution, there were no African-American citizens in the United States. Therefore, the Framers never contemplated that African Americans could be U.S. citizens. Curtis refuted this conclusion, pointing out that there were African-American citizens in both northern and southern states at the time of ratification. They were part of the "people of the United States" that the Constitution described. In addition, Curtis stated that "every free person born on the soil of a State, who is a citizen of that State by force of its Constitution or laws, is also a citizen of the United States." The majority opinion also held that the Missouri Compromise was unconstitutional because Congress did not have the power to legislate policies on slavery in the federal territories. Curtis countered this finding by noting 14 instances where Congress had legislated on slavery prior to the Missouri Compromise. He concluded that this demonstrated that Congress had the power to regulate slavery in the territories. "At the time of the ratification of the Articles of Confederation, all free native-born inhabitants of … [five states], though descended from African slaves, were not only citizens of those States, but … possessed the franchise of electors …"
In Cooley v. Board of Wardens, Curtis enunciated an enduring principle concerning the Commerce Clause of the Constitution. Prior to Cooley, the Supreme Court had failed to resolve the issue of state power to regulate interstate commerce. In his majority opinion, Curtis held that the Commerce Clause did not automatically bar all state regulation in this field. At issue in this case was the constitutionality of a Pennsylvania law requiring ships entering or leaving the port of Philadelphia to hire local harbor pilots. Although this was a regulation of inter-state commerce, Curtis upheld the law. He reasoned that the term commerce covered many topics, some requiring national uniformity, others calling for diversity of local control. The distinction between local and national aspects of interstate commerce was a major contribution to constitutional interpretation. Cooley is regarded as one of the most significant Commerce Clause cases of the nineteenth century. Curtis left the Supreme Court shortly after the Dred Scott decision. The decision so polarized the Court that Curtis did not feel comfortable serving with the other members. He returned to Boston and resumed his law practice. Curtis was pulled back into the national arena in 1868, when he served as defense counsel at the Impeachment trial of President Andrew Johnson. He made a lasting contribution to the theory of impeachment by convincing the Senate that impeachment is a judicial trial, not a political proceeding. This meant that impeachment required evidence of misconduct rather than a finding of no-confidence in the president. As an author, Curtis gained prominence for his publications Reports of Cases in the Circuit Courts of the United States (1854), Digest of the Decisions of the Supreme Court (1856), and his posthumously published Memoirs (1879). Curtis died on September 15, 1874. Curtis, Benjamin R., ed. 2002. A Memoir of Benjamin Robbins Curtis, LL.D. : With Some of His Professional and Miscellaneous Writing. Union, N.J: Lawbook Exchange. Maltz, Earl M. 1996. "The Unlikely Hero of Dred Scott: Benjamin Robbins Curtis and the Constitutional Law of Slavery." Cardozo Law Review 17 (May).